For brides and grooms who hail from Canada, unique Canadian wedding rings can be a great way to show off both your love for one another and your love for your country. Learn how to express yourself with one-of-a-kind Canadian style! 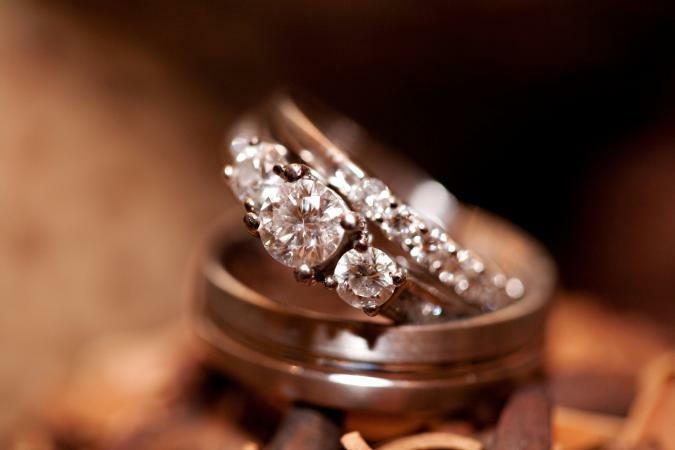 Unique Canadian wedding rings often use materials naturally occurring in Canada. These include Canadian gemstones and metals, such as Canadian diamonds and gold from mines in Canada. Some couples choose rings that feature Canadian imagery. You might find wedding rings that show off Canada's mountains, lakes, rivers, or trees. Canadian wedding rings can also feature Native American designs that represent the culture of Canada. Your wedding ring can also show off your Native American heritage. With over 60 tribes native to Canada, this history and culture play an important role in the lives of many Canadians. To find wedding rings with Native American design elements, simply do an Internet search for jewelry from your specific tribe. You'll likely find items crafted by Native American jewelers, as well as traditional motifs that carry great meaning for native cultures. Canadian Diamonds: This site provides Canadian-mined loose gemstones, wedding rings, and engagement rings. Brilliant Earth: This eco-friendly and socially responsible jewelry site features diamonds from Canadian mines. ReflectiveJewelry.com: Dedicated to socially responsible jewelry, this site features conflict-free diamonds from Canada and several wind and wave designs. Bearclaw Custom Native Jewelry: Based in Canada, this Native American jewelry site has wedding rings that feature beautiful native designs.